Wilma Wilson got to live her dream on Friday with the help of Amica at Barrie’s ‘Dreaming to Doing’ program that helps make a senior resident’s wish come true. 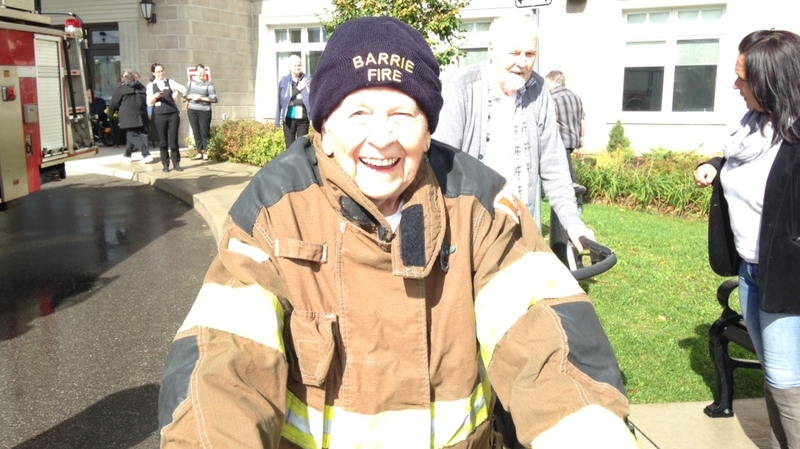 The 84-year-old was shocked when firefighters showed up at Amica at Barrie where Wilson resides to take her for a ride in the fire truck. Wilson said she was fascinated with fire trucks since she was a little girl in the 1930s. Throughout the day she also got to spray water from the fire hose, meet the chief and pretend to answer 911 calls. Wilson also spent some time at the fire station and said it was a day she can’t wait to share with her grandchildren and great-grandchildren. “Oh I think they’ll be fascinated,” giggled Wilson. Wilson dressed in some Barrie fire gear for a calendar photoshoot that will be created for her to remember her big day.